This is the perfect drill for any home user, but this DeWalt Cordless Drill Driver is also powerful enough for professional use. It can handle practically any job from the woodwork to steal and even masonry and concrete. In this review, we will be taking a closer look at what this impact drill really is. If you are looking to buy this drill, read on to help you decide if this is the right drill for you. Here are some of our favorite features of this DCS970KL XRP Drill. 450 Watts of Power – this allows the drill to function well in practically any job that requires drilling or fastening. Three Speed Transmission – While most drills in the market have a 2-speed transmission, this drill comes with three. The speed settings are as follows, there are three speeds for drilling and another three for hammer drill mode. LED Light – Like many of the newer DeWalt Drills, this one comes with an LED light that illuminates the work surface. This makes it easier to work in dark places. Mid Tool Handle Placement – Unlike some drills that are heavier on top than on the bottom, the DCS970KL was designed with an ergonomic mid-tool grip. This keeps it balanced in the user’s hand and also helps reduce fatigue. 360-Degree Side Handle – Provides users with additional stability in handling the tool. It also is instrumental in reducing fatigue when the tool has been used for hours. This drill also features a self-tightening chuck. The 1/2 inch chuck tightens more as it is being used. This helps to keep the chuck in place and helps to avoid the problem loosening chuck and wobbles. In fact, I believe that this is one of the drill’s best features and it is what will make it last longer. Tools like these are only going to be useful as long as they are running and the DCS970KL hammer drill cannot its lithium ion batteries. The batteries on this drill provide users with up to 40% extended run than your standard NiCAD options. They are also compatible with other XRP DeWalt cordless tools. The batteries charge within 1 hour using the yellow charger that comes with the purchases. Each drill also comes with a 3-year limited Warranty from the manufacturers. If you want to read more user reviews for this hammer drill, click here. There really does not seem to be many negatives for the DCD970KL. Most of the people who have purchased it either for home or professional use have been very satisfied. One complaint is that it is a heavy drill. Well, the drill is heavier than most of the other drill/drivers in the market because it weighs 6 lbs. This weight, however, translates into the drill’s power. If you are looking for a drill to do a lot of hard work, then you should be prepared for the weight. Anyway, DeWALT has anticipated this issue and has added a 360-degree side handle. This helps provide some stability to make the drill easier to use. If the weight turns you off, here are some great alternatives. These drills are lightweight and great for small tasks, but they will not have the same power as this DCD970KL Hammer Drill. 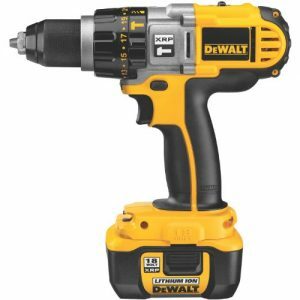 DeWALT provides a lot of information on their products and this includes the DCD970KL Hammer Drill. Amazon also provides a lot of info. Click here to get to the Amazon product page now. If you want to get the hammer drill you can click here now.